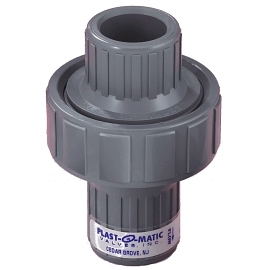 Check Valves – Plast-O-Matic Valves, Inc.
POM check valves prevent reverse flow of liquids. Designed with no wetted metals, they are ideal for use with water, extremely corrosive liquids, and ultra-pure liquids. Most importantly, POM check valves do not use ball designs common with competitive checks. This eliminates the leaking, rattling, distortion, and other problems ball checks are prone to. 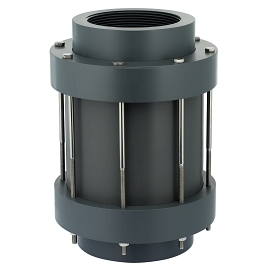 Series CKM A unique, patented diaphragm provides normally-closed operation with a bubble-tight seal, even with no reverse pressure. 1/2″ through 1″ pipe sizes. Series CKS An encapsulated spring and sliding poppet provides the same normally-closed, bubble-tight performance in larger sizes 1 1/2″ through 4″. Series CKD Because Series CKM and CKS require minimal cracking pressure up to 1.5 PSI to open, Series CKD is offered for very low pressure applications. 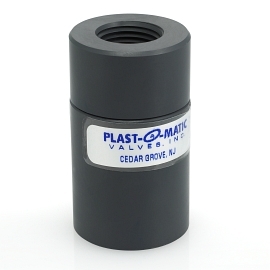 Available in 1/4″ and 1/2″ sizes. Normally Closed Check Valves 1/2" – 1"
Normally Closed Check Valves 1 1/2" – 4"
Normally Closed Check Valves 1/2" - 1"
Normally Closed Check Valves 1 1/2" - 4"
Series CKS An encapsulated spring and sliding poppet provides the same normally-closed, bubble-tight performance in larger sizes 1 1/2” through 4″. A specialty diaphragm check valve that opens with virtually no forward pressure. However, Series CKD requires a minimum back pressure of 1/2 PSI to close. When inlet pressure is sensed the sealing disc is pushed off the valve seat opening the valve. In this position the sealing disc is supported internally allowing the valve to operate under high flow conditions with relatively no force or stress on the disc. 1/4″ and 1/2″ sizes in PVC, Natural Polypro, PTFE or PVDF.